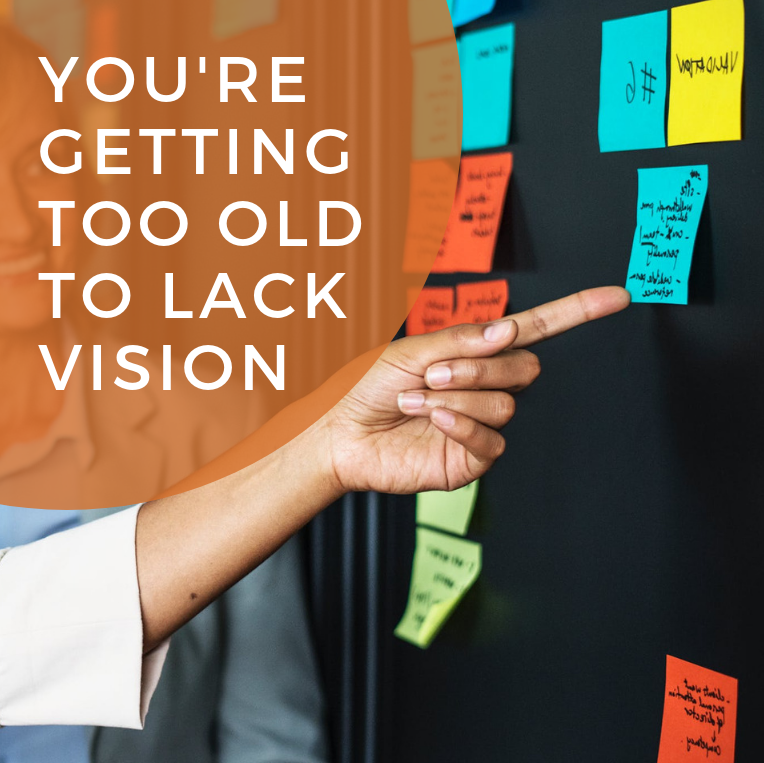 Your're Getting Too Old to Lack Vision - The Idea Inc. It was an old tattered shirt. Dad brought it home after a long day of selling African-American art at a local fair. It said, “If you do not stand for something, you will fall for anything.” I was a teenager at the time so easily rolled my eyes at such a statement. I wore it though. I had it well into my college years. It seems trite and something you could easily ignore, but stop for a moment and say it. I assumed that this meant something out of my experience. For example, I feel strongly about prison reform. I have stopped eating at certain restaurants (Chick Fila), watching shows, supporting brands because even if it is just me, I will not put one of the most impactful resources we have to brands and people that do not stand for the same ideals I do. But this is not about my soapboxes. It is about standing for yourself. Listen, honey. In the end, you have to be about you. I have learned that the hard way. You can and should love others. You can and should stand for what’s right and yet at the end of the day, stop yourself and consider what is important to you. In this case, I am going to edit that t-shirt I received from my dad now many moons ago. “If you don’t stand for yourself, you’ll fall for anything.” It is true. The wind can blow and you change your mind or you can be so consumed with taking a leap or even a small step that you have Groundhogs Day called a life. Get up. Get dressed. Work. See family. Repeat. I want you to consider having a vision. Here are some hard truths to getting there. Not everyone needs to have a big vision. Sometimes what you see as “small” is your next and best move. How you see yourself is all that matters. An important step in identifying your personal vision is being clear on what works for you and realizing that may not sooth other people’s insecurities and that has to be okay. Create a list of what is important to you now. For example, do you like dogs, art, the beach, working out, reading a good book and/or writing? If you do not like those things, but you find when you do them you feel better, one or more of them should be a part of your life at least 2 or 3 times per week. So, I looked at the above and did it first so you can see how it looks in the end. Small vision: I want to do more speaking engagements. My small vision is to write the first draft of a speaker one-pager. Works for me: I really like to have downtime throughout the week and on the weekend. I have been awful at this because I am often pulled in 101 different ways. I was reminded that my mom was taking care of us growing up as so many of our parents did and still managed to get her hair done every month and have personal time. It seems small, but she made herself a priority so now looking back, I recognize the connection between her self-care and my confidence as a woman. Your go. Let us know how you do.